Yet, another phone stand or is it? This corporate Bluetooth Speaker And Holder giveaway always deserve a second look at first glance and an interesting merchandise you can tie to your business. A fully functional 2.1 Bluetooth speaker, it also doubles as a smartphone holder with suction cups on the top. Available in 2 colours, it comes with a rechargeable Lithium 400mAh battery with an output data of 3W and 4 Ohm. Main print position: back. Other positions also available by request Our speaker items are printed in up to 8 colours via pad print, which is a technique suitable for almost all artwork and shapes. 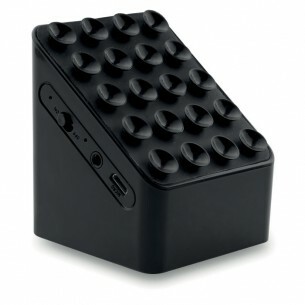 This bluetooth speaker and holder is made from ABS, with colours including black, white.